Tags: Kraft, Kraft and seed paper range. 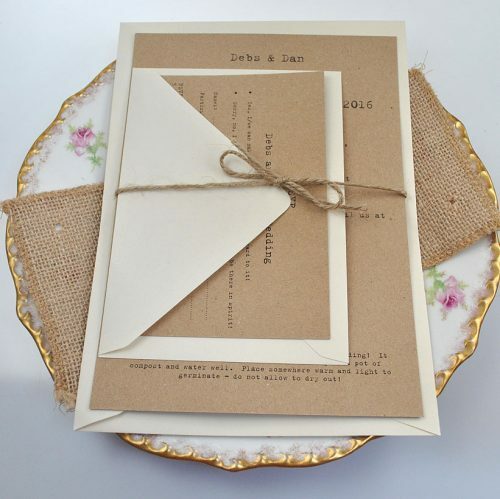 We love the vintage, uncluttered feel of this recycled Kraft wedding invite set with seed paper. The invite is printed on quality, thick recycled Kraft card (280 gsm) and is A5 size. 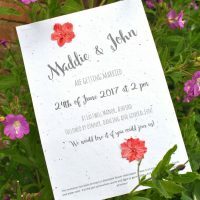 It comes with a recycled paper heart attached, scattered with flower seeds – Black-eyed Susan, Daisy, Spurred Snapdragon, Poppy, Sweet Alyssum and Catchfly. This paper will germinate into flowers, yay! 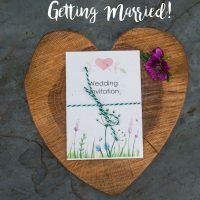 A recycled envelope (chosen from whichever colour envelopes we have in stock at the time you order) is also provided so that the invite doesn’t have to be folded. Planting instructions are printed at the bottom of the invitation. 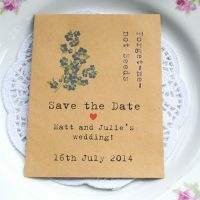 The RSVP is also printed on the same recycled Kraft card and is A6 size. It, too, comes with a recycled envelope. 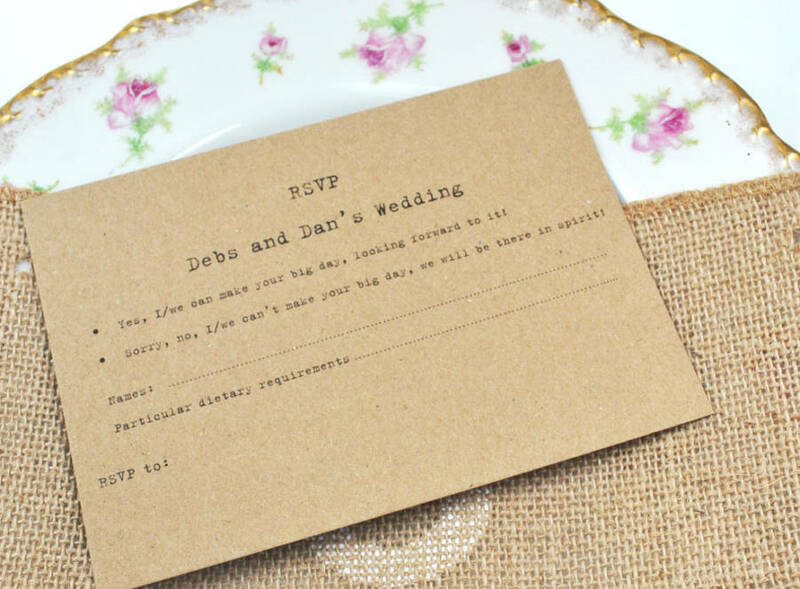 The invite and RSVP are held together with twine. Please provide your wedding details in the box above or email them over after you have ordered. We will send a proof before printing. We can also create you anything else you need to match this design! Just drop us an email. Simply place the heart on top of a pot of compost (preferably peat-free!) and water well. Spring and summer are the best times of year to do this so that you can have the flowers on show in your garden in the summer! Place somewhere warm and light to germinate and keep moist – it is vital to successful germination not to let the paper dry out! Once you have lots of seedlings, transplant the whole lot into a bigger pot and place on your patio in a sunny spot. We do not recommend planting the paper directly in the garden as there is the risk of slugs and mice eating the seeds/seedlings. The photos below show the flower seed paper germinating and flowering.